Thank you for taking a look at my saddles. Shopping for a new saddle on the net can be very challenging to say the least. Saddles can be made a lot of ways and not all of those ways are good. A saddle made from quality leather, hardware, and tree will cost $950-1800 in Materials Alone. It then takes between 50 and 100 or more hours to complete.. so make sure to shop around and ask your saddle builder how his saddles are made. Import Leather, Plastic Trees, Staple Guns, and Screwed on Stings and Concho's are just a few ways to make a saddle cheaper. And Cheap sturrips!! Stay away from these.. if your horse ever falls on you the cheap sturrips will crush your foot and most likely trap you in the sturrip! My saddles will come ready to ride with cinches and with Nettles Monel stirrups. My Custom saddles are all made with the greatest attention to detail possible. 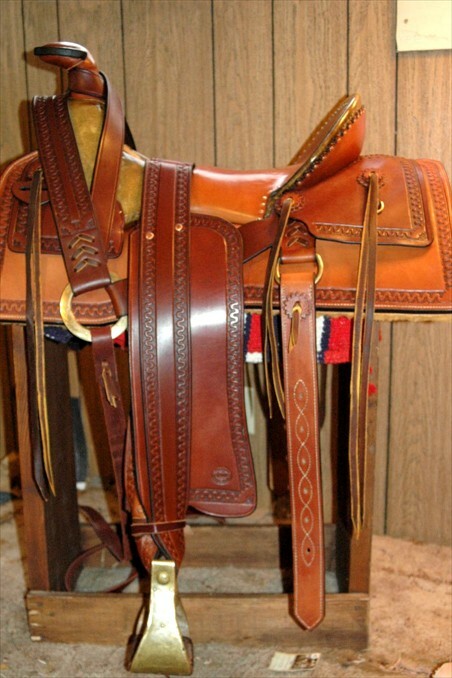 I was raised riding horses and chasing cattle in the mountains of Montana so I have a good idea of what it takes to make a good saddle that fits the rider and your horse like it should. I can make you a light weight trail saddle....If you are sore after a days ride then there is a good chance that your saddle dosn't fit you like it should. Or a heavy duty working saddle... As your rope comes tight on a 2000 lb angus bull is the wrong time to discover that your riggin was not made right!